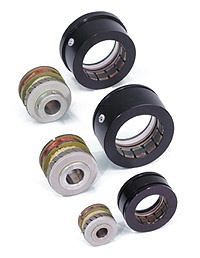 Inductive resolvers are considered more rugged than rotary encoders for use in adverse operating conditions involving extreme temperature (up to 220 C), high shock, vibration or dirty environments. 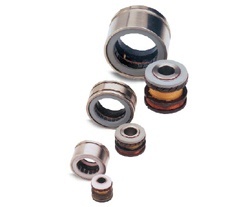 Shielded, spaced support bearings found in our resolvers provide up to 10x the life of duplex bearings. Tooth-wound models cut electrical error 50% and brushless resolver models eliminate components that can limit life. Available in housed and frameless varieties. Housed-Brushless Resolvers Our brushless construction uses a rotary transformer to pass the reference signal to the rotor. This design eliminates the normal brushslop ring sliding contact used in conventional resolvers. Since the brush and slip ring are life limiting components and can be a source of noise in harsh environments, the transformer coupled units enhance reliability and performance. 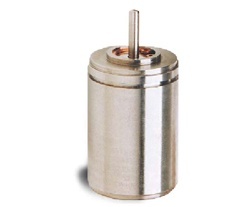 Industrial Frameless Resolvers Our brushless resolvers are the ideal position feedback transducer for brushless motors, robots and direct drive motors in precision rotary platforms and similar servo applications. They are rugged, reliable, provide absolute position information and are able to operate at 155 degree Celcius and are impervious to most particulate and liquid process contaminants. The industry standard Size 11 resolver series has its own precision bearing system, making it ideal for coupling mounting. Its brushless construction uses a rotary transformer to pass the reference signal to the rotor -eliminating components that can limit life and cause noise. Series 11 has excellent angular accuracy and repeatability. Alternatively, the R11 shaft accepts pinions or pulleys for use in rack and pinion or cable measuring systems. Series 11 resolvers are rated up to 155C for high temperature applications. Harowe R25 Heavy Duty resolvers are designed for reliability in adverse operating conditions. Brushless resolvers are the better choice over encoders for applications that involve very high temperature, vibration and shock and dirty environments. Unlike similar duplex-bearing packages, the R25 resolver uses a front-and-rear bearing arrangement that provides two to three times the radial load bearing capacity and up to ten tomes the L10 life of a package with duplex bearings. Rated for ruggedness with IP65 protection, 125C continuous duty, shock resistance to 200g and vibration resistance to 40g. 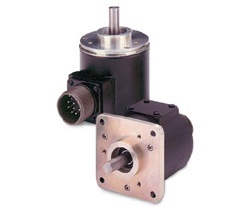 These Harowe resolver models provide absolute position feedback for brushless motors, robots and direct-drive motors in precision rotary platforms and similar servo applications. This heavy duty frameless resolver series is ruggedized against vibration and shock, able to operate up to 200 C, resistant to noise, and impervious to most industrial contaminants. Options include multiple speeds, radiation hardened, high temperature, flux shielding technology and stainless steel housings. The 700 Series Harowe resolver product line provides maximum accuracy and minimum error for demanding position and velocity applications such as robotics. HaroMax resolver sizes 15 and 21 feature a tooth-wound design that reduces electrical error 50 percent less than that of a standard resolver and incorporates windings that are manufactured and installed completely automatically. The automatic installation provides the least amount of part-to-part variation for the greatest consistency. This set of high end resolver models are able to operate up to 200 C with high shock and vibration resistance.